China deployed warships to extract citizens from Yemen amid growing violence there. Updated, 6:11 a.m. ET| China evacuated nearly 600 of its citizens from conflict-torn Yemen this week in Chinese warships, in a demonstration of Beijing’s increasing ability to extract its people from dangerous places. 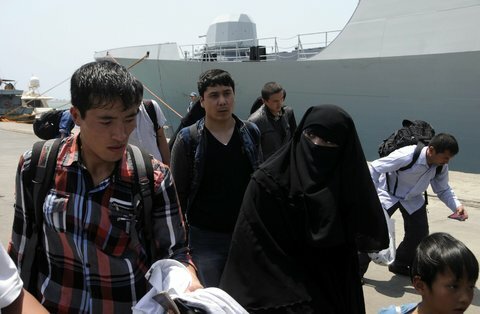 Although the Yemen effort was on a much smaller scale than the evacuation of about 35,800 Chinese workers from Libya in 2011, it involved two Chinese Navy frigates, accompanied by a navy supply vessel, docking at ports in Yemen and carrying the Chinese evacuees away. In Libya, after the overthrow of Col. Muammar el-Qaddafi, China largely relied on rented cruise ships and cargo vessels, with one navy vessel overseeing the operation. 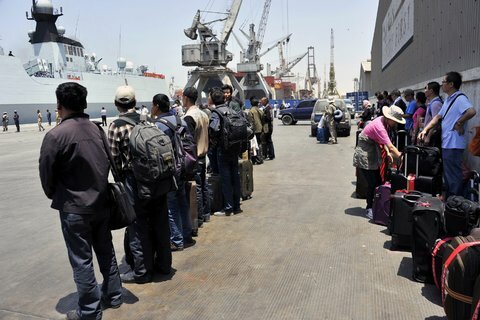 The first group of 122 Chinese workers boarded a frigate in Aden, the major port city of Yemen, on Sunday afternoon, Mr. Tian told Xinhua. A second group of 449 Chinese boarded another frigate in Al Hudaydah, on Yemen’s west coast, on Monday, he said. Both ships headed across the Gulf of Aden for Djibouti, and from there, the workers were flown to China. Mr. Tian said that China was not abandoning Yemen and that the embassy in Sana and the consulate in Aden would remain open. Champions of the fast-expanding Chinese Navy would also be pleased, Mr. Goldstein said. “The crisis may be somewhat useful to the growing chorus of Chinese ‘navalists,’ who will argue that having a Chinese Navy that operates routinely on all the world’s oceans is critical to protecting the interests of this maritime trade juggernaut,” he said. The two frigates were diverted from duties off Somalia, where China has been participating in international antipiracy operations since 2008. 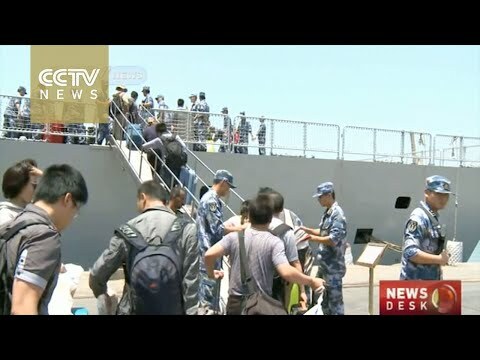 Given the Chinese Navy’s familiarity with the waters around the Horn of Africa and nearby Yemen, the evacuation was likely to have been a relatively easy task, Mr. Goldstein said. Many of the Chinese workers in Yemen were involved in oil exploration, others in construction and fishing. Yemen provides oil to China but is not a major supplier. A group of 104 Chinese evacuees who arrived in Beijing Tuesday night were workers with a subsidiary of a state-owned China National Building Materials Group Corp. in Abyan, where the company built and operated a cement plant. They described hearing an intensifying battle around the port of Aden before they sailed on the Chinese frigate Linyi on Sunday afternoon. The Chinese sailed for six hours to Djibouti across the Gulf of Aden, then flew to Addis Ababa, the capital of Ethiopia, before proceeding to Beijing. As they walked through the airport in Beijing, the exuberant workers wore souvenir caps from the Linyi, and waved tiny Chinese flags to the waiting photographers, and even to strangers. As he boarded a bus at the terminal, Mr. Geng praised the way the crisis was handled, saying he was grateful that the company would continue to pay his salary when he returned to his village. “Thanks to the Party! Thanks to the motherland!” he said. A company official was less effusive. The company had paid for the hotels and airline flights on the trek out of Yemen, and there was no telling when business would resume in Yemen, he said. “We have suffered huge losses,” he said.